I haven’t blogged in over two months. So much has been happening, I don’t even know what to blog about. If you could screw off the top of my skull and release the contents of my brain, the thoughts would come leaping and scrambling out like clowns from a tiny car. Remember the post about job hunting? Well, I have a new job. That job includes a new schedule and longer hours. Still haven’t figured out how there’s time to cook dinner and get some exercise and write and pay attention to my family and my boyfriend all before bedtime. (Plus there’s Netflix; damn all those TV shows.) I know that working moms all over the country do it—heck, I did it for years—but it’s kicking my hiney right now because I’ve had this cakewalk schedule for the last two years. Welcome back to the world of grownups, Meg. Also, I moved. I read once that moving is the third most stressful event for humans, after death of a loved one and divorce. (Pretty sure “job change” was high up on that list, too.) So, I guess it could be worse, but yeah—it’s pretty stressful. Also included in moving stress: I shacked up with my sweetheart and we’re ADJUSTING. “Adjusting” involves trying to fit two households into one home and trying to remember how to share space with someone after you’ve been single for 15 years. I’ve only freaked out once so far. And the big, downhill-rolling boulder that is my daughter’s departure for college continues its rapid descent onto my poor mom-heart. Maddy leaves in less than a month. She needs plane tickets and dorm furnishings and a laptop and luggage and a warm winter coat. Hopefully I can come up with the money to pay for all of those things and still have enough left for a case of Two-Buck Chuck to drown my sorrows. It’s pretty bad. I’ll be driving down the freeway or doing the laundry—just minding my own business– and out of nowhere, BAM! Emotional ambush! Fine one minute, a weepy mess the next. So, all in all, this is a good time for me—new job, taking the relationship to the next level, kids are growing up and doing what they’re supposed to do—but it’s also a boatload of transition all at once. I’ve got no cause to whine because all my transitions are good transitions, but most days I feel like my life is racing ahead of me and I’m being dragged along behind it with a death-grip on the bumper. Oh! Suddenly I thought of a metaphor! (I really thought of this right now, spontaneous-like.) My life feels a little bit like parasailing right now. 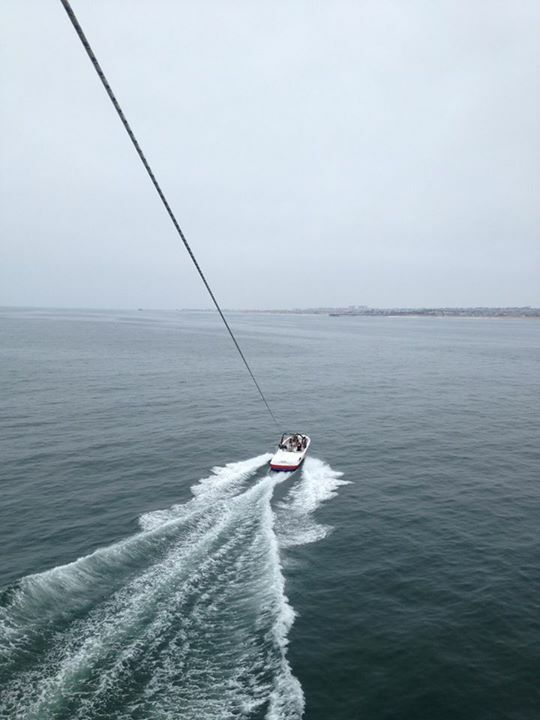 I was totally game for the parasailing, when Victor asked me to go– I didn’t feel afraid at all. That was stupid, because as it turns out, parasailing is actually pretty terrifying. I was fine until it was time to go up. IF! IF you want to hold on! Holding on is optional! So my rational mind knew that it had to be pretty safe—they let any schmuck do it; you don’t have to be fit or strong or know what you’re doing, and obviously you can’t screw it up or they’d give you more directions. Must be safe, right? We climbed up on the back of the boat in our big, loose harnesses and they hooked us up and ZOOOM! Up we went! 600 feet! It felt just like an elevator. My harness felt just like a swing. My boyfriend was with me, taking pictures all around with his iPhone, dangling next to me without a care in the world. And I was CLUTCHING the ropes for dear life. White-knuckled, rigid arms—clutching. I understood that I was safe, that I could not fall, that holding on was optional—shoot, Vic was right next to me, happily using all his limbs—but NOTHING could have pried my fingers off those ropes. Nothing. We were up there for about 12 minutes, I think. I managed to take in the amazing view; I marveled at the coastline and all the tiny people on the beach—probably pointing up at us lunatics dangling over the ocean—and I even enjoyed it when the captain reeled us in and dipped us low so our feet could trail in the water. But all the while, I held onto those ropes like my children’s lives depended on it. I squeezed so tight that my arms started to fatigue, and I was terrified that my strength would give out and I’d have to let go. Vic took this…how’s that for perspective? There’s the metaphor: clutching. My life feels like it’s flying out ahead of me and all I can do is hold on. All this frantic feeling…all this desperate clutching for nothing…questioning my own strength when my strength is irrelevant, because this ride won’t stop no matter what I do. Just like I knew I was safe in that harness, I know am safe now. Everything is going to be fine. The clutching is instinctive, self-protective, but it’s not necessary, and I’d enjoy things so much more if I could just let go. One way or another, I will let go. I’ll either wise up or wear out. And either way, I’ll be fine. This entry was posted in Uncategorized and tagged empty nest, humor, irrational fear, job change, letting go, midlife, moving, parasailing, transitions by midlifemeg. Bookmark the permalink. Thanks, Valerie. Big hugs to you and your family. You are all on my mind constantly these days. Thanks, Joanne, and thanks for reading. Hope all is well with you and your family.